Hello all, this is Mad Dashiell here and thank you for joining me today. Fantasia Film Festival 2018 is is on the way. Let us ring it in by celebrating this exclusive hand-painted poster for one of the most amazingly titled features to make its way for its world premiere. The stoic being, the sentinel of the bar in THE BIG LEBOWSKI is THE MAN WHO KILLED HITLER AND THEN BIGFOOT. Sam Elliott as the titular World War II veteran who secretly assassinated Hitler before being recruited by the FBI and The Royal Canadian Mounted Police to take out Bigfoot. 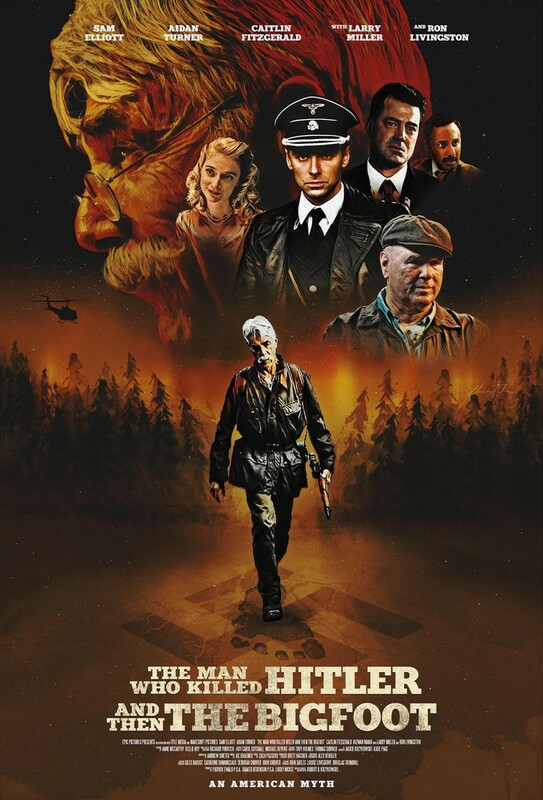 Written and directed by Robert D. Krzykowski (ELSIE HOOPER), and produced by John Sayles (Lone Star), THE MAN WHO KILLED HITLER AND THEN BIGFOOT also stars Aidan Turner (THE HOBBIT series), Caitlin Fitzgerald (ALWAYS SHINE), Ron Livingston (OFFICE SPACE) and Larry Miller (PRETTY WOMAN). The film premieres at Fantasia Film Festival in Montreal this next month. -Worthy note: Another interesting premiere- Dans La Brume and Tales from the Hood 2! -Thanks for joining me today, this is Mad Dashiell signing off.